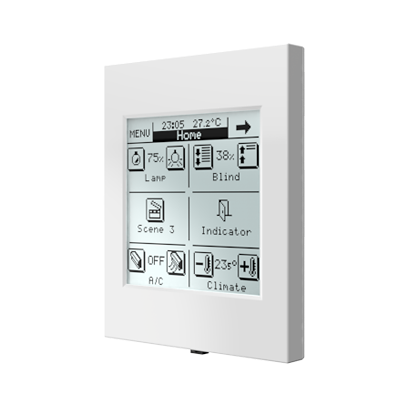 The InZennio Z38 touch panel represents a giant leap forward in communication with your home. Minimalist aesthetics, dominated by simple forms, lead to a timeless design that facilitates integration within working and living environments. Its 3.8” square display makes your management and enjoyment easier, enabling distributed communication within the smart home. Available colors: polar white, silver and anthracite gray. Optional IR remote control. IMPORTANT NOTE: This product, ZN1VI-TP38, is no longer under production. Nevertheless, it counts on all the support (manuals and databases updates, spare parts and technical support) that may be required. IMPORTANT NOTE: This application program is only for touch screen ZN1VI-TP38. In case you own a touch screen ZN1VI-TP38i, please, refer to its specific site, here.